A blog about designing global user experiences: beyond language, location & culture. Smartisan is a new Android-based mobile operating system designed in China. The launch was in Chinese, however Engadget gave an in-depth summary of the launch in English. It ends with rapturous applause as Luo Yonghao show’s Smartisan’s solution to this problem: a bar with flags to denote language settings. While the flag icons definitely help, I don’t think they’re ideal here because they could also suggest regional or location settings: timezone, date format or currency. I think some of the approaches highlighted elsewhere on this site would work far better. But stepping away from icons, Smartisan could actually do far better to deal with this sort of scenario — and in fact, all software designers could. Let’s reconsider the scenario we’re dealing with here: a user who speaks language X is trying to change the language of the phone which is in language Z. 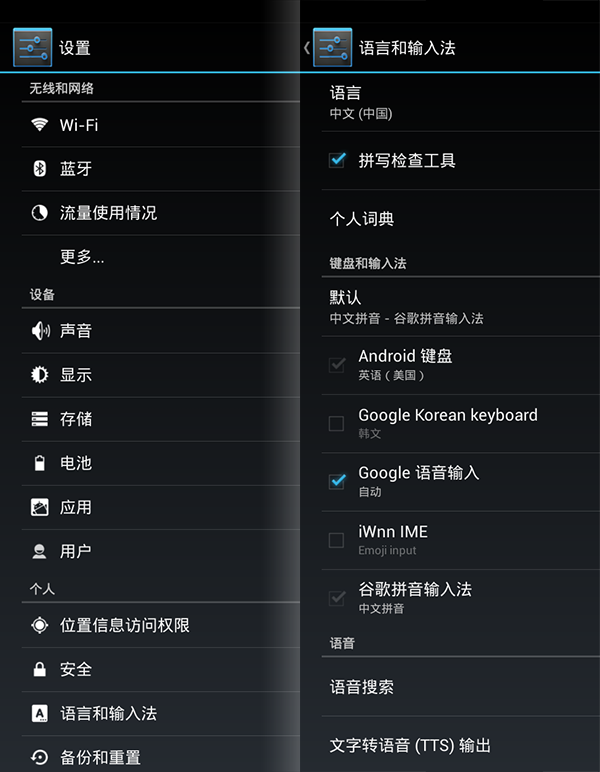 Going back to the Smartisan example, the flag icons are at the very bottom of the settings screen. A user has to scroll to the very bottom to find them. Arguably the language settings on a phone should be at the very top of the settings screen: in the Android example shown first, it’s actually the third in the list. Make the operating system remember the previous language setting and label the language selection in the previous language in addition to the current language. You’re in for some serious guess work here if you don’t read Chinese and want to change the language. Would this be annoying for users who change their language on their devices? Probably not too annoying — and how many users do this anyway? Would it be useful for those who accidentally changed their language — or have been the victim of a prank? Immensely. Flags aside, this is a much better way of dealing with language selection on all devices. Officially known as Barclays Cycle Hire, Transport for London’s blue hire bikes are a ubiquitous sight around London. 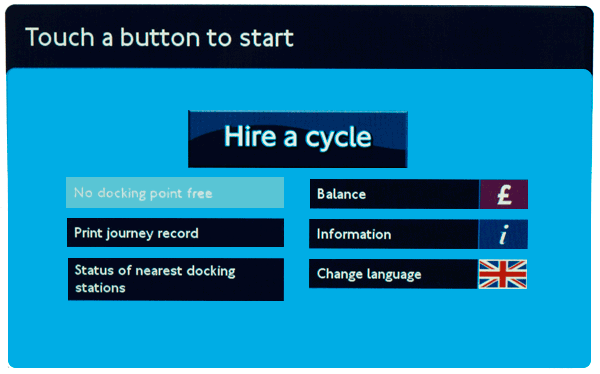 Hiring a bike is fairly straightforward using the interactive kiosks located next to docking stations around the city. The kiosks support seventeen languages: along with English, the system is localised in German, Spanish, French, Italian, Arabic, Bengali, Gujarati, Hindi, Chinese, Polish, Punjabi, Tamil, Turkish, Urdu, Vietnamese and Japanese. The use of the British flag is an interesting choice. While the system doesn’t explicitly use flags to represent languages, it does use a flag to show availability of languages. 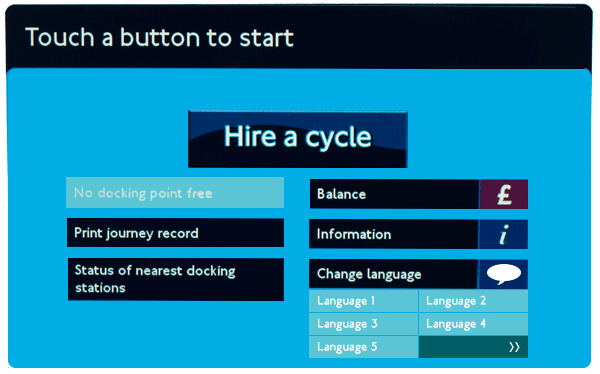 It would be very interesting to see stats on how many users actually find and use localised versions of the kiosk. By using the British flag alone, could the system possibly miscommunicate itself? London’s official promotional organisation London & Partners provides visitor statistics to London by nationality. The top three nations are the USA, France and Italy. This allows us to begin to understand the types of users who would be using the system. Probably not a major issue — but it does suggest the language selection proposition represented by the British flag is not as strong as it could be. As a visitor or new immigrant, does the British flag suggest it could be exclusively for British citizens only? By virtue of the flag being isolated here, again this is a possibility. Ironically the presence of other flags would probably negate this. Obviously the majority of visitors from United States would not need translated content. Many French, German and Italian users may have a good enough grasp of English to navigate the system without translation — so users from those countries might not use the translations as much as users from perhaps Asia or South America. The most effective strategy for presenting translation options would be to find the balance between the group of language speakers that would benefit most from translation versus the group of language speakers that comprise the largest number of users. Once establishing this, language selection can be based on this priority. The new design above shows a more generic speech bubble icon instead of a flag to represent language. 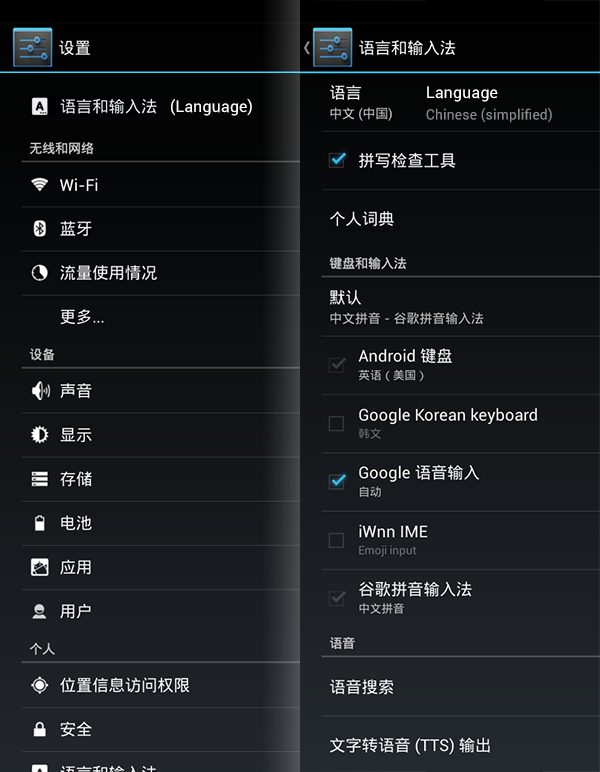 It also displays five languages on the home screen and a button alluding to further languages being available. Would the above screen work better at showing language options? Potentially — of course the only true way to know would be to test this with real users. When it comes to developing for internationalisation, there are two very important ISO codes: ISO 639 (languages) and ISO 3166 (countries). Within these codes there are two- and three-letter code variations for both language and countries. The simplest (and one of the most popular) are the two-letter code variations: ISO 639-1 for languages and ISO 3166-1 for countries. Unsurprisingly, many countries and languages share the same two letter code. Spain and Spanish (es), France and French (fr), Thailand and Thai (th). But there are some rather important languages codes that do not correlate directly with a country code. For instance, the Arabic language for uses ar which is Argentina’s ISO 3166-1 code. English’s en has no matching country code at all — it’s official 3166-1 code is gb for Great Britain. The Chinese language is zh in ISO-639 whereas China’s ISO-3166-1 code is cn. 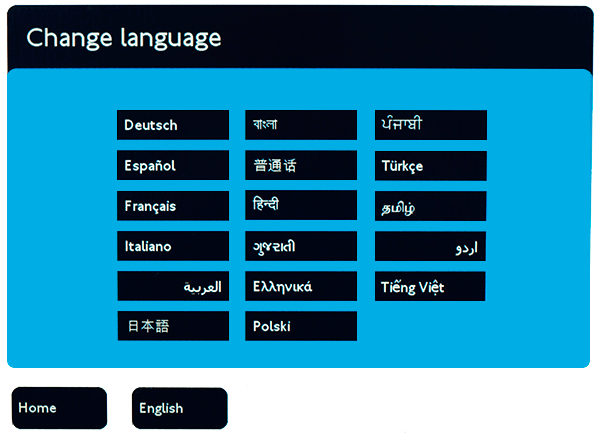 Music streaming service Deezer uses flags to represent languages. One example in particular shows the pitfalls in assuming direct connections between languages and flags: the language code for Malaysian (ms) is different from the largest Malay-speaking nation, Malaysia (my in ISO-3166-1 — also, Malaysian is also spoken in Singapore). Instead the flag next to the Malay link (Melayu) is actually that of the tiny Caribbean island of Monserrat, whose country code is (of course) ms. The largest and simplest lesson from the Deezer example is to simply check that any flags you use (for any purpose) are actually the right ones. But this issue wouldn’t have arisen at all had Deezer not decided to compliment languages with flags from the outset. Bab.la is an excellent online language resource with online translation as one of its core services — in an impressive 22 languages. The site makes heavy use of flags as iconography, with some interesting flag choices: Arabic is represented by the Egyptian flag, Swahili by the Kenyan flag and Hindi by the Indian flag. Arabic is an official language in 24 countries other than Egypt (however, Egypt is by far the largest by population) and Swahili is an official language in four countries. While Hindi is the most widely spoken language in India, there are 22 official languages in India. Furthermore, English is represented by the Union Jack; however it is an official language in over 50 countries. Also, the United States which has many more English-speakers than the United Kingdom. (The same argument can be applied to the use of Spanish and Portuguese flags for those languages in relation to Mexico and Brazil respectively). Regardless of whether flags are appropriate in this situation, another question can be posed: do the flags actually aid in legibility of the translation menu? Or are they actually distracting? Arguably the Google Translate is easier to read and far more compact on screen: and it achieves this in part by not using flags to represent languages. Posted on September 13, 2012 Author adminCategories Arabic (العربية), Chinese (中文), Czech (čeština), Danish (dansk), Dutch (Nederlands), English, Finnish (suomi), French (français), German (deutsch), Hindi (हिन्दी), Hungarian (magyar), Italian (italiano), Japanese (日本語), Korean (한국어), Romanian (română), Russian (русский), Spanish (español), Swahili (Kiswahili), Swedish (svenska), Turkish (Türkçe)4 Comments on Bab.la: flag overload? Bethesda Blog: language or location? It’s hard not to look at the Bethesda Blog ‘gateway’ page and ask whether they’re asking for your location or language. 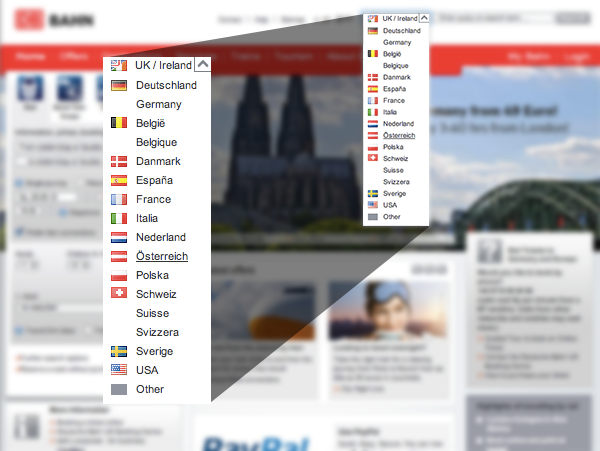 Many sites that use flags to represent languages rely on the subtle implication that a flag will assist users in choosing their language. But the fact that this page is solely dedicated to language selection and only presents users with flags explicitly suggests the site is only accessible by users from the USA, France, Italy, Germany and Spain. The flags are also large and bold in their size: there’s no excuse here that as icons they take less space. Would simply listing the language names not be far simpler and more effective? 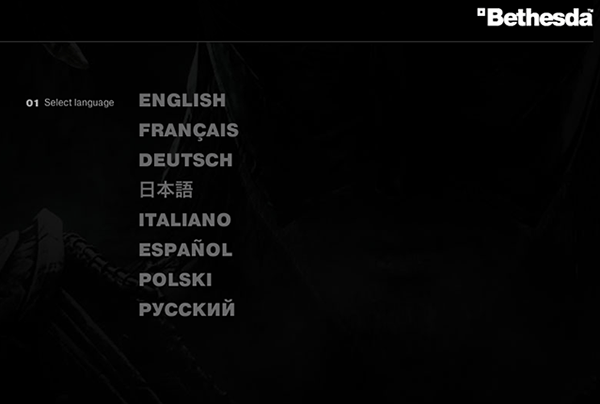 Posted on August 24, 2012 Author adminCategories Autodetect language, English, French (français), German (deutsch), Italian (italiano), Japanese (日本語), Polish (polski), Russian (русский), Spanish (español)1 Comment on Bethesda Blog: language or location? While flags are sometimes used to show the availability of translated content, there are many other methods and conventions available — many of which are simpler, more effective and more appropriate. 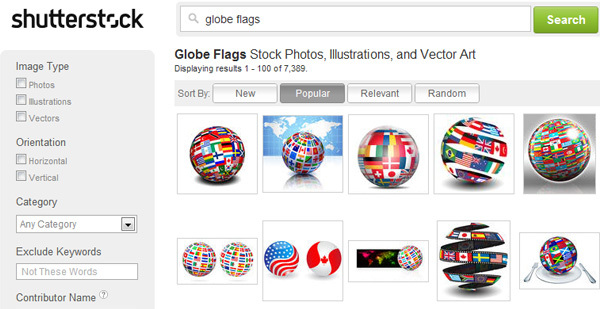 If the content is specific to language and country, then individual flags are highly appropriate. But languages within countries should not be generalised: many countries such as Belgium, Canada, India and Switzerland have a mix of different primary languages. The reverse goes for languages — languages are not always exclusive to countries. For instance English and Spanish are both spoken by far larger numbers of people outside of England/Britain and Spain respectively. Sometimes flags are used as a more general abstract concept in communicating the presence of translated content. Some potential problems with this approach is that it lends itself more to ‘global’ or ‘international’ symbolism. While this certainly overlaps with language, it may not be the best choice unless your content varies both in language and by region. For instance, many airlines may want to present different languages and different content depending on a user’s location. But take a website such as city tourist board or local government. This approach is not particularly suitable, as the content is unlikely to change based on a users location: only on a user’s language. The Apple OS and many Linux distributions use a United Nations-esque flag to represent ‘international’ options. These settings also commonly overlap more than just languages: they often include date formats, number and currency formats and also language. Within a system preference environment, this icon works relatively well – as there is very little for it to be confused with. But in a broader context of the web and beyond it may be more confusing: users may wonder what the United Nations has to do with your content. The globe is a powerful and highly recognisable icon. While that may be its main strength, it also represents a weakness, as it has come to represent a broad range of subjects. The globe can broadly be interpreted as region, country, timezone as well as a representation of networks and the web. For better or for worse it has also been chosen by Facebook as the icon for ‘notifications’. John Yunker argues why this is a bad choice – and while his arguments are convincing – it still means that another meaning has become attached to the ubiquitous globe. Returning to some of the reasons why multiple flags may not work, the same reasons can be applied to the globe: if your content is regional/country and language specific then it can be a good choice. However if you’re only providing the same content to all users in a variety of languages, the regional-aspect of the globe icon might not be the most appropriate choice. OMC² Design Studios in Italy have thought about many of the dilemmas already described here and have attempted to create an icon that best represents translations. There is obviously a need for an icon of this sort, but the problem with the icon they have produced is that it is perhaps too abstract. 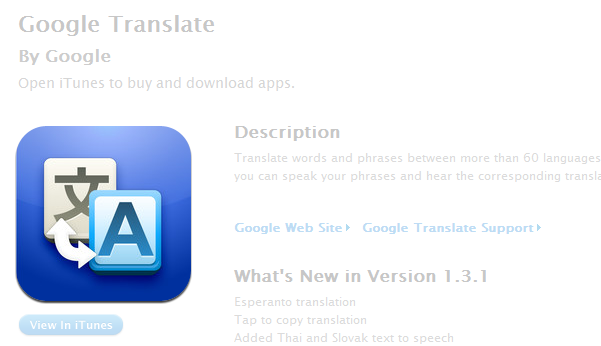 Nothing in the icon really suggests translation or languages. While globes and flags may not be the best they would still provide a far more powerful visual message than this icon. Designed by Farhat Datta this ‘turnstyle icon’ won the A’ Design award in 2013. 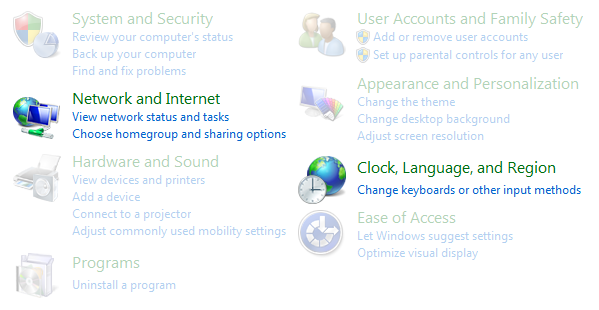 It is arguably a far stronger icon that reflects other approaches outlined on this page. Speech is inherent to language – but in the majority of situations translated content is read and not heard (or spoken) – especially online. Much like the globe, the speech bubble is often also used to symbolise ‘contact’ and also messaging — such as with Google Talk and Apple’s iChat shown above. 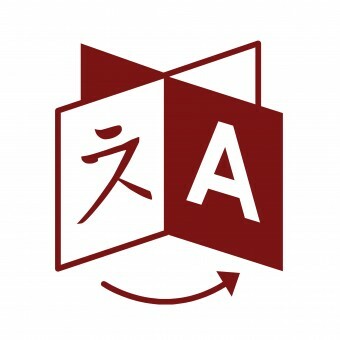 Another approach to graphically representing translation is mixing characters: probably the most ubiquitous being Google Translate’s logo, which places the Chinese character ‘文’ (which can mean script, page or character depending on context) next to the latin ‘A’. This approach definitely relates to the reading element of translated content far stronger than speech bubbles do. It also works well through contrast: Chinese and latin characters are so different it’s hard for this design to have many other meanings apart from one related to language. Google Translate is also a truly multiplatform product: the same Chinese/latin icon appears across not only the web but also mobile and tablet apps. Microsoft’s approach to translation icon design reflects Google’s: the only difference being a choice of the Japanese letter ‘あ’, which is the first character in Japanese alphabetical ordering. Much like Google, this icon is seen across many platforms: from Outlook through to Bing Translate. Design-wise, the mixed character approach is very strong: it is simple and uses contrasting icons within itself to evoke a higher meaning. Coupled with the clout that Google and Microsoft products have, is this the strongest convention we have for symbolising translation? While these icons pertain specifically to providing a translation service, pre-translated content can certainly leverage the fundamental concept of these icons. Is the mixed script the best icon available – or are there other approaches that are more powerful and appropriate? Dropdown menus, when used well, are a very useful form of interaction. While the pros and cons of dropdowns have been well discussed elsewhere, it’s useful examining them in the context of language/region selection. When a user interacts with a dropdown menu, it’s a reasonable expectation that there are a certain degree of choices contained within the menu — hence the designer’s choice in hiding the content. But looking at the region selection dropdowns at The Guardian and Moo, the dropdown only reveals one extra choice: wouldn’t this be far simpler (and more obvious) as either a radio button or list of links? CNN has more regional choices than The Guardian or Moo, yet they have opted just to list the options available. CNN’s approach is simple and effective: don’t complicate selections of anything on your site with a dropdown unless there are numerous options that would otherwise clutter the page. (Note: while CNN is very well designed, linking to the Arabic edition of its content would be better done with Arabic written in its localised form rather than just the English). 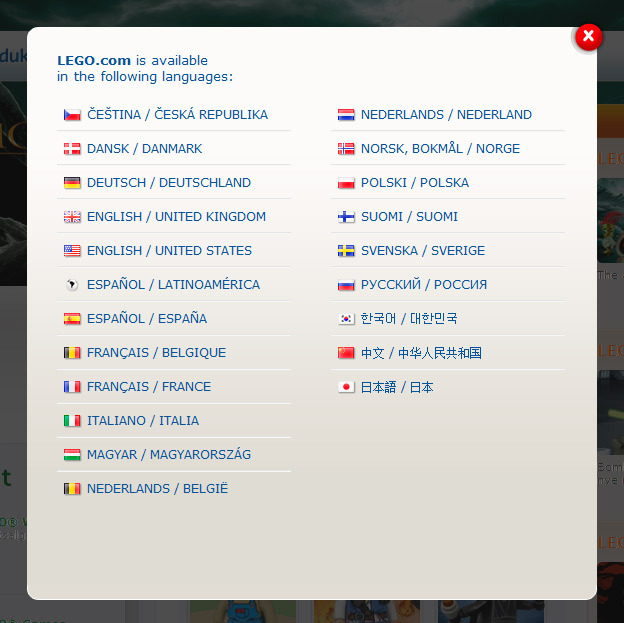 The LEGO website is available in 17 languages. When a user goes to select language, they are prompted to first choose their country or region and then their language as appropriate. 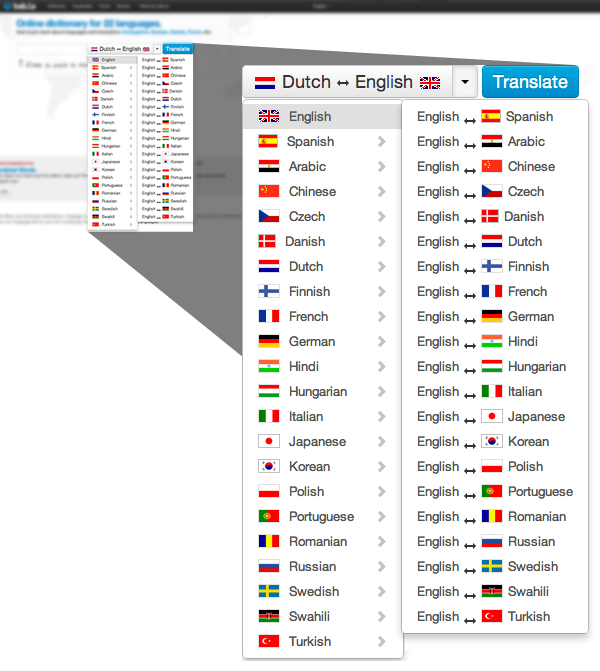 Belgian users have the option of French or Dutch content specific to their country; Spanish users can select Spain or Latin America as appropriate. The use of flags here gives priority to country/region first — which is why it works. Only for Latin America is a flag not used, as it is obviously referring to a whole region and not a specific country. Language is a secondary option. In this scenario, LEGO’s use of flags works very well. As a global brand, LEGO has registered domains in many other countries even though they do not have local content for all of them. The site does its best to redirect users to the most appropriate version of the site. Australia users visiting www.lego.com.au are redirected to the UK English site; Canadian users visiting www.lego.ca are redirected to the US English site. As the site gives priority to country over language, this is a much better approach than just combining flags with language names. However, there are limitations to this approach: Swiss users accessing www.lego.ch are redirected to the German site. 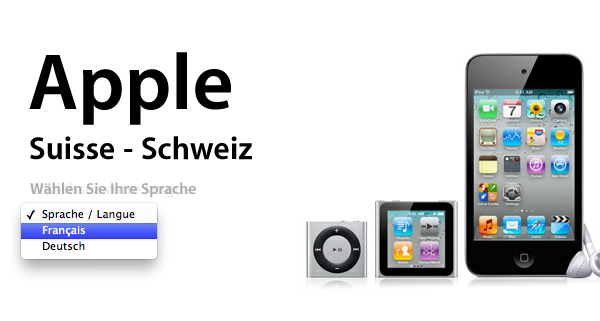 French-speaking Swiss users may not appreciate this, but given there is no specific Swiss content available this is far more acceptable than just redirecting them to a generic German-language site. Ideally, however, the LEGO site would do better checking the language of the user and redirecting them based on that — not just the domain they’re visiting. While it’s not perfect, the thought that LEGO has put into its user experience for international users is highly commendable. 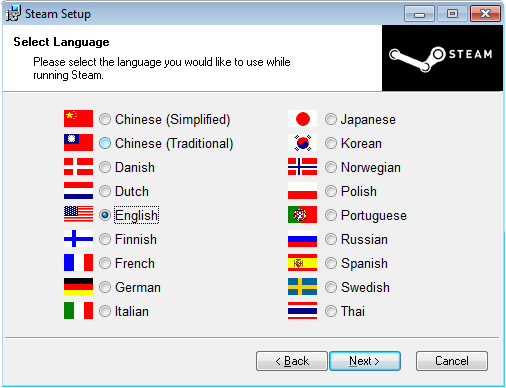 Steam: choose language or choose country? The Steam client is a great video-gaming platform. It allows users to buy and download games, connect with friends and share screenshots from their gaming experiences. 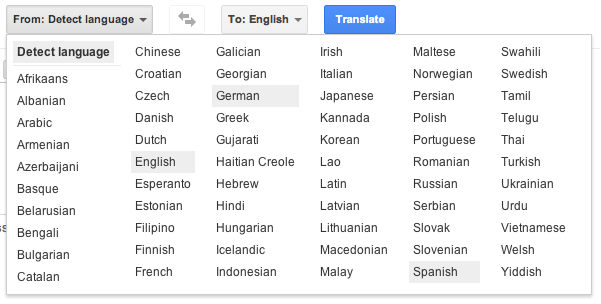 The website is available in 24 languages, and it even has a community-driven translation project. However, unlike the website, the Windows client has some issues with language versus location. The choice of Chinese Simplified versus Chinese Traditional is interesting: Simplified is the norm in mainland China, yet Traditional is mostly used in Taiwain (but also Chinese ethnic groups outside of mainland China). But the other flag choices are inconsistent: the United States flag is used for English. Understandable perhaps as Steam are a US-based company, but a look at the Steam client stats server reveals Steam has heavy usage in other English-speaking countries such as Australia, Britain, Canada, Ireland, New Zealand, Singapore and South Africa. While there is no data on Brazilian users versus Portuguese, by sheer population numbers one would expect Brazil to have more users than those in Portugal: yet the Portuguese flag is used for Portuguese. Again, this is inconsistent with the choice of the US flag for English. As for Spanish, how many users are in Spain compared to Argentina, Chile and Mexico or other Spanish-speaking countries? Are Steam really asking what country the user is in, or what language they prefer? It appears to be a confused mix between the two. Another problem with this install process is the lack of localised names — forcing users into selecting a flag to for their language (whilst the language is labelled in the English-name for that language). The Steam website handles translations brilliantly: each language is localised and also in English for disambiguation. And no flags. However, their installer client needs some more thought. Posted on December 6, 2011 Author adminCategories Chinese (中文), Dutch (Nederlands), English, Finnish (suomi), French (français), German (deutsch), Italian (italiano), Japanese (日本語), Korean (한국어), Polish (polski), Portuguese (português), Russian (русский), Spanish (español), Thai (ภาษาไทย)Leave a comment on Steam: choose language or choose country? Many Canadian websites provide content in both French and English. The Montreal Canadiens, an ice hockey team based in French-speaking Quebec, have employed a powerful and clever way for users to choose the language they prefer for their site. One half of a player’s face links to French, and the other half of another player links to English. 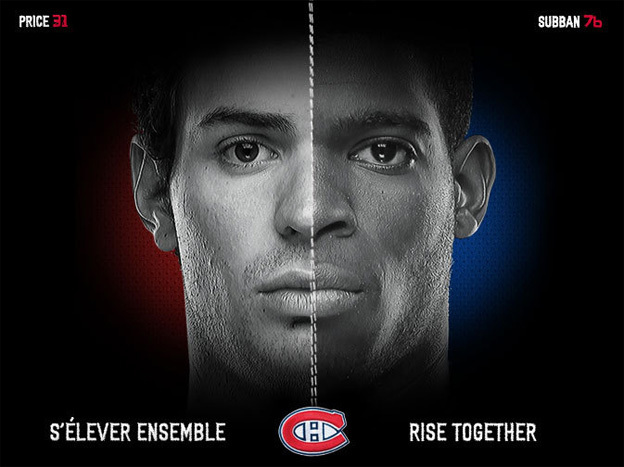 Both links are accompanied by the Canadien’s motto: ‘rise together’ in the appropriate language. An inspiring way of integrating language selection with the motto and ethos of a sports team.